The goddess Aphrodite (Roman Venus) is carried ashore by a pair of Ichthyocentaurs (fish-tailed centaurs) following her birth from the sea-form. 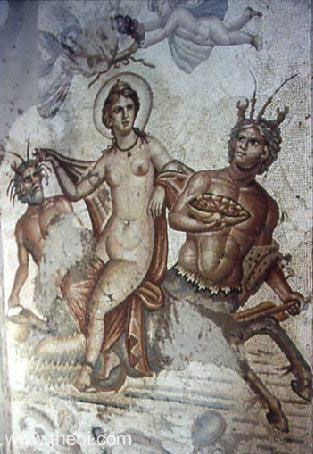 The pair are named Aphros and Bythos in the mosaic. A pair of flying Erotes (Roman Cupids) prepare to crown her with a wreath of myrtle. The goddess is draped in a loose, red cloak and is crowned with a shining aureole.